Foreigners to learn Chinese in China has become a common phenomenon. Expatriates living in China has sixty thousand people, many of them will live and work in China for a long time, so they need to learn Chinese to adapt to Chinese life, and improve the work efficiency. But most foreigners will encounter pronunciation, writing and the complicated language system and many other difficulties in the process of learning , let them squealed. How to learn Chinese can improve efficiency and make the process less painful? Many intelligent people find all kinds of textbooks, and seek online learning platform, to ask professional learning method, but there are still a problem, that is how to more directional, more systematic, more effectively combine these study methods, and get better and faster progress? The answer is to go to a professional Chinese school, with the teacher guidance, to achieve the effectiveness of get twice the result with half the effort. 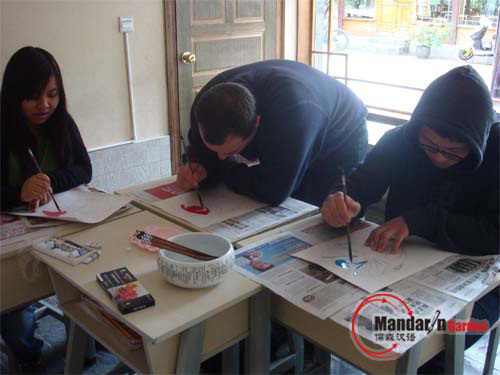 Mandaringarden teachers are high quality, and each teacher has a global industry standards of the international registration of Chinese teachers' qualification certificate, the certificate level is influenced by international recognition, so for our teaching practice ability can be at ease. There are also very interesting teaching techniques in the class, such as "role play", "game and practice", "memory exercises", and "language points and replace practice" and other vivid diverse teaching link, help get rid of the difficult of learning Chinese in China, in a pleasant experience to learn Chinese.